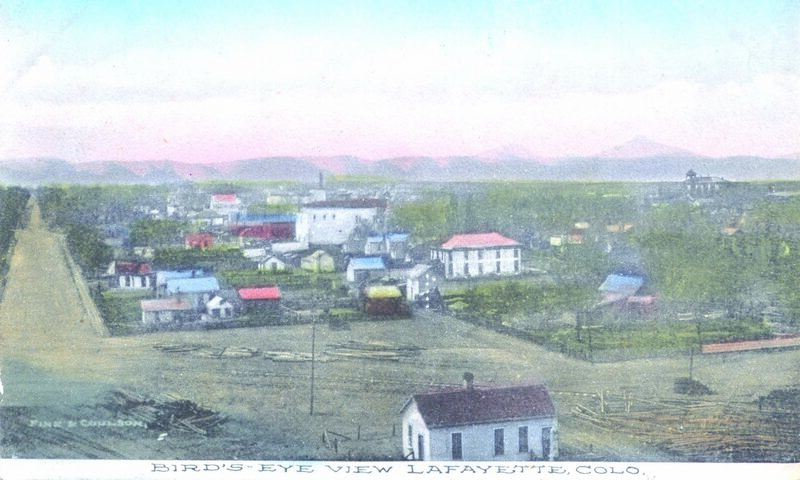 Historical insights and discoveries for Lafayette, Colorado. 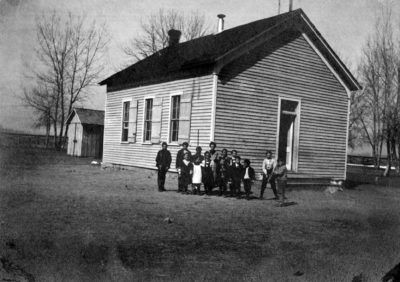 A handful of students at the Willow Glen school; photo was taken in about 1885. Photo courtesy Lafayette Miner’s Museum. There were enough school-aged children on the farms in the Coal Creek area by 1875 for parents to want a school close at hand for their children. 1875 was before any of the small towns were settled, before even the coal deposits had been established as a resource to be developed. The first step was for five “legal voters” to call for a special meeting to establish Coal Creek School District 29. The organizers were Lafayette Miller, David Kerr, William Willis, W. W. Eggleston and A. S. Eggleston, and the meeting was at the Kerr farm on Coal Creek. Officers elected were Albert Eggleston of Davidson as Secretary, A.C. Goodhue of Erie as Treasurer, and David Kerr, President. Minutes of the meeting record that a tax was levied to build a school for the district, to be located at an area called Willow Glen which was near U.S. Highway 287 and Colo. Highway 42. There were 25 children in the district: 17 boys and 8 girls with 13 children under age five years. As a record of the families in the area and attending the school, the pupil register in 1875 included Lewis Eggleston, George and Abigail Haff, James, William, Leonnah and Edith Kerr, Mary Kilkirk (probably Kilker), Thomas, Charles and George Miller, Willie Nawatny, Frances Pendleton, John, Christopher, Frederick, Julius, Charlie, Almenia and Emma Stecker, Anna Quirk, Thomas Smith, Wm. Wallace, Oliver Willis and Adolphe Waeneke (Waneka). Henry Adolf (Adolphe) Waneka was Adolf and Anna Waneka’s son. Among those pupils were four boys between ages of 17 and 19. Lafayette and Mary Miller’s farm, where today’s Lafayette City Hall is located, was known as Willow Glen Farm. The Miller children were enrolled in Lafayette schools from 1875 onward. This meant that Mary Miller probably tended the farm while Lafayette Miller operated his butcher shops in Erie and on 14th Street in Boulder starting in 1874. During this time period, Millers owned a house on Water Street, now Canyon Street, in Boulder. The extent or boundaries of the Coal Creek School District are not in our record, but locations of some of the farms are known. The homestead of David Kerr and family was east of present-day Louisville. Lafayette Miller’s land became the site of today’s Lafayette. The Egglestons came from the Davidson community a few miles to the north of present-day Louisville. Adolf Waeneke (Waneka) built his first home on the south side of Coal Creek at today’s Murphy Hill. In addition to the names of the students from these families, there were others from the extended neighborhood who are not easily identified today. The district minutes say Miss McCarty commenced teaching on October 19, 1875, for $25 a month. On October 20 she discontinued teaching after a half day. Miss Mollie Scott began teaching November 3. By 1894 a principal was in charge of District 29 at $65 a month. In September 1898, Coal Creek School District 29 was divided forming Louisville School District 29 and District 43. Mary Miller, a resident of the newly founded Lafayette, was named president of District 43, according to the minutes. What is known is that District 43 became the Broomfield school district. The school district for Lafayette became #52. It has been reported that the Lafayette district was formed in 1881 although the town was not platted or named until 1888. A school district for children who lived east of the Town of Louisville became Willow Glen (also known as Willow Grove) School District 61. Mrs. Mary Scott with her 24 Lafayette students pictured in 1889 at what looks like Public Road and Cleveland. Photo courtesy Lafayette Miner’s Museum. 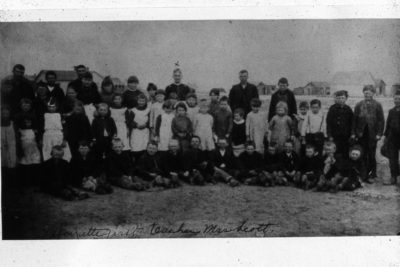 Miss Barnd, standing left middle, one row in from the back row, with her students at the first Baseline School, a brick structure built using local bricks. Photo would have been taken sometime between 1891 to 1897. Courtesy Lafayette Public Library. Lafayette’s first school, a house, was located at 408 E. Cleveland and Mrs. Scott was in charge of 24 pupils. Residents later approved (in 1889) a two-story brick building on Baseline Road at Iowa Avenue. The Boulder News reported in August 1889 that “a schoolhouse was being built in Lafayette to cost $4,000.” Substandard bricks used in the construction necessitated a new wood frame building that was built in 1904 at the same site. The second Baseline School was condemned due to subsidence, then rebuilt and expanded in 1918. 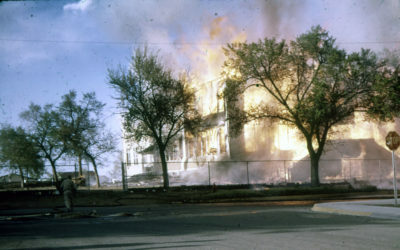 The school was abandoned in the early 1960s and burned down in 1964. 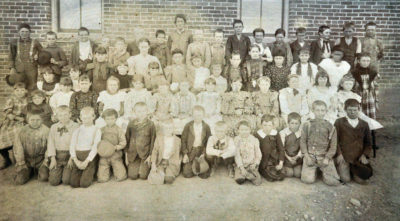 The forty-two students at the 1889 brick school on Baseline Road included Bert Hurd, Martha Byers, Mary McDonald, Mary Belle Morrison, Florence Thomas, Stella Thomas, James P. Miller, John Moon, William Hurd, Rose Simpson, George Moon, John T. Burt, May Moon, Anna Schweiger, Hattie Murrie, Elizabeth Abernethy, Anna Koenig, Bessis Tovado, Sabina Schweiger, Eva Hall, Bert Simpson, Thomas Hunter, Willard Murie, Frank Byers, Ethel Smith, Polly Simpson, May Schweiger, Hattie Moon, Alice Abernethy, Antone Schweiger, Arthur Hurd, William Burt, John Cuterson, Joseph Mayhoffer, George Allentine, William Abernethy, John Koenig, Joseph Koenig, Thomas Abernethy, William Moon, Ed Schweiger and John Murie. Teachers included Mrs. Mary Scott and Miss Elizabeth Barndt. This text was used by permission and written in 2004 by Carolyn Conarroe for her book “Louisville Legends: The Record as History.” It has been updated by Doug Conarroe to include Lafayette schools. Sources include Jim Hutchison’s book, “Survey and Settlement,” printed in 1994. Local retail locations where you can find our books. The proliferation of indexed digital documents has significantly simplified the historical research process. Using property records, online maps and resources found in Colorado libraries, lots of missing pieces regarding our area’s history can be reassembled and explained. To that end, this site debunks the notion that everything we know about Lafayette, Louisville and Eastern Boulder County history has already been discovered. All contents copyright 2019. The main photos for this blog site, shown at the top of this page, are early photographs of Lafayette and Simpson Street from the Doug Conarroe collection. Visit our companion website at www.6000bees.com and read about our efforts to save some of Lafayette’s historic homes.